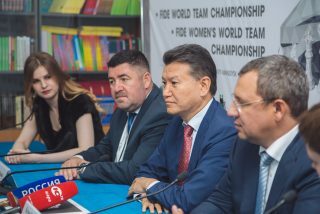 A press-conference with the President of FIDE Kirsan Ilyumzhinov, the President of Ugra Chess Federation Vasily Filipenko and the executive director of the World Team Championships 2017 Valery Radchenko. 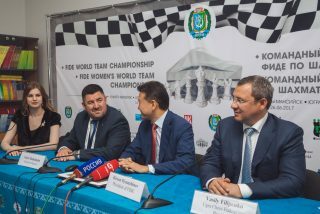 – Kirsan Nikolaevich, it’s the first time both men’s and women’s World Team Championships are held in the same place. How do you estimate the level of organization of the tournaments here? – I would like to use this opportunity to thank the Governor of Ugra Natalia Komarova for this tournament. We met today in the morning and discussed the event. I also like to thank Vasily Filipenko for taking part in the organization of this tournament. The latest tendency in FIDE is to hold open and women’s tournaments together. There’s a little discrimination as you can see because women can participate in men’s tournaments whereas men cannot participate in women’s events. As for Ugra, this is the first place that holds open and women’s World Team Championships together. 10 men’s and 10 women’s teams are playing together in this fantastic hall. I think that we will also hold such tournaments in the future. I’d like to emphasize that Ugra Chess Academy is one of the first buildings in FIDE countries made especially for hosting chess events and teaching chess. 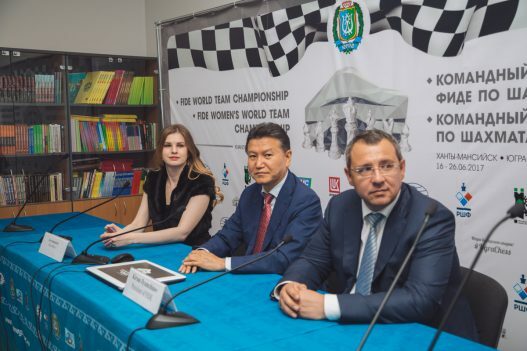 International Chess Federation now has 188 participating countries. 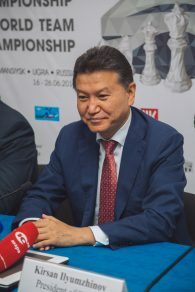 Ugra has rich chess traditions. In 2010 the World Chess Olympiad was held here. And that Olympiad was one of the best in the chess history in terms of organization as well as spectacular opening and closing ceremonies. 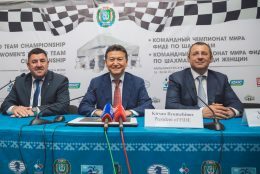 So it is not by chance that the latest FIDE General Assembly in Baku voted for another Chess Olympiad in Khanty-Mansiysk in 2020. 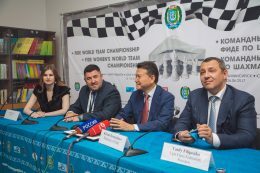 And we gave this right not only because in Ugra you have all conditions for professional players and top events but also because chess is very popular among ordinary people here. We also took into consideration that Ugra has Chess in Schools program here that is developing really well. 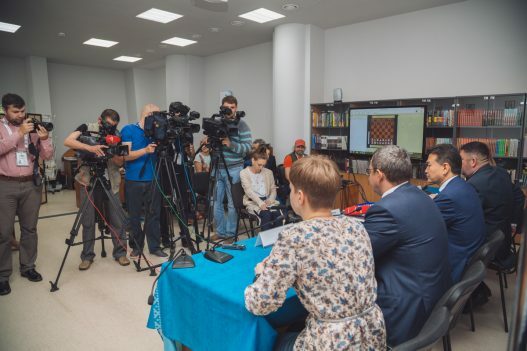 Another Northern territory – Norway – brought to the world the reigning World Champion Magnus Carlsen, so I hope that Ugra will also become a motherland of a future champion and such a genius like Magnus Carlsen. In 2005, he was my nominee for the World Cup here in Khanty-Mansiysk and I can say that his career started to develop at that time. 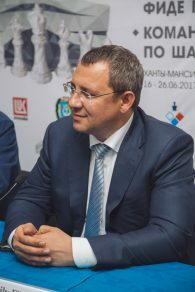 – Vasily Alexandrovich, after such an inspiring tournament here do you think that more children will start to learn how to play chess? 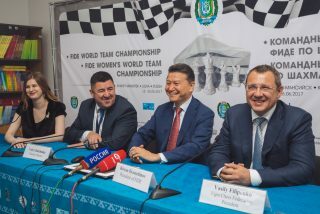 – First I would like to thank FIDE for the support we get from them. 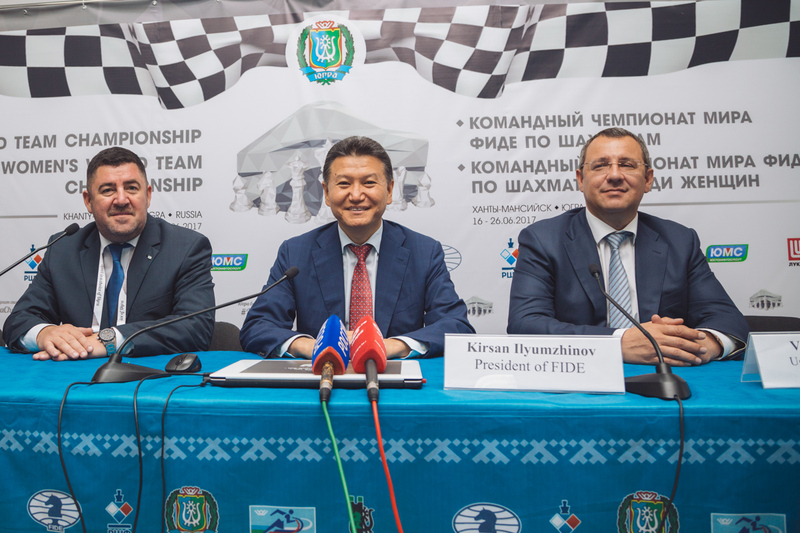 All these international tournaments held in our region get the full support from FIDE. 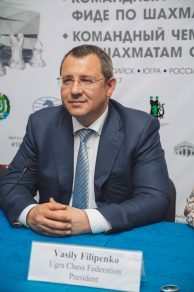 The Government of the region and the executive directorate of the tournament take all the efforts to make players and accompanying persons feel comfortable here in Ugra. 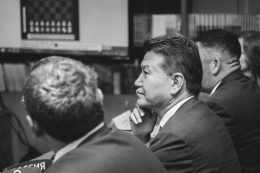 From the very beginning the Ugra Chess Federation had two directions of developing. 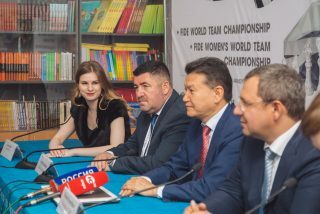 First, we want to have more children playing chess and second, we always wanted to host many international events here, as they attract more interest to chess in the region. 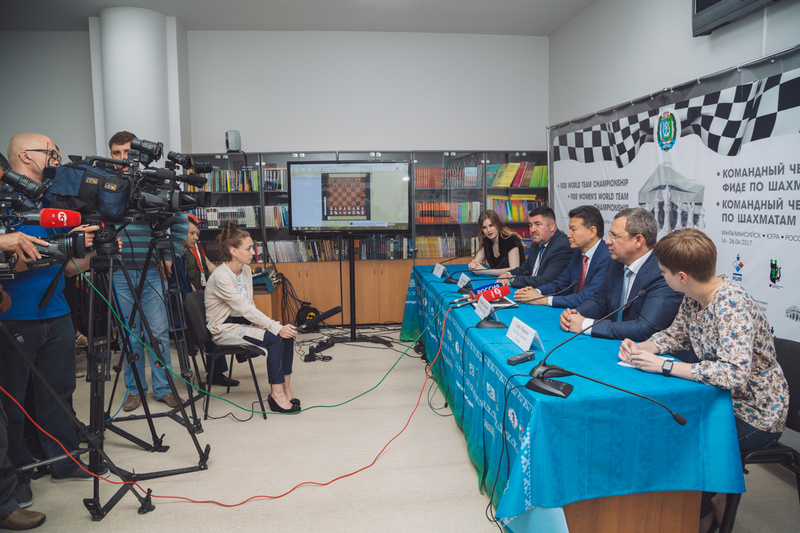 From September 2016 chess is in the school curriculum in Ugra. 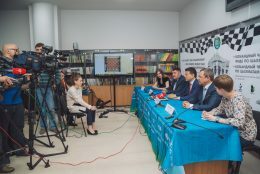 We think that it is very important that our children will have opportunities to learn how to play chess and decide whether they want to become professional chess players or maybe to become another Magnus Carlsen, or perhaps they prefer to do something else like biathlon or ice-hockey. – Valery Mikhailovich, tell us how the tournament is going on from the organizer’s point of view? 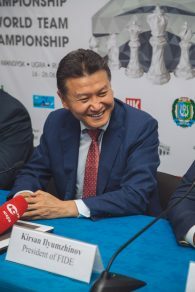 – We are very grateful to FIDE for giving us an opportunity for hosting such a fantastic tournament here in Ugra and also for appointing such a professional team of arbiters and members of the Appeals Committee. “UgraMegaSport” is an organizer of many multisport events and, of course, there are always some minor issues to be solved on the first days of any tournament. All of them were solved and after the first couple of days everything goes smoothly. We have arbiters’ meeting every morning and we are also in a close contact with captains of all the teams. 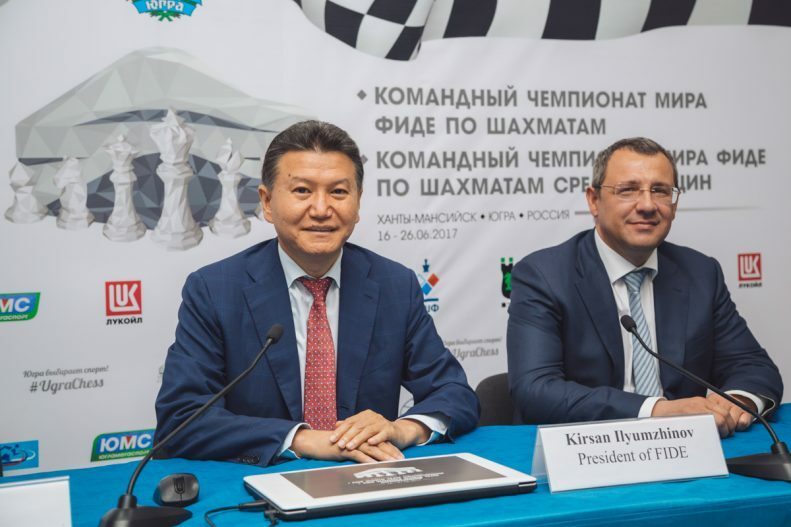 I would also like to mention that during this event we have started getting ready for the next tournament in Khanty-Mansiysk in 2018 which will also go under the auspices of FIDE. We already have a draft contract prepared.